Born: Aug 5, 1930 in Wapakoneta, Ohio, U.S.
Died: Aug 25, 2012 (at age 82) in Cincinnati, Ohio, U.S.
Neil Armstrong was born on August 5th, 1930 in Wapakoneta, Ohio. He was a famous American astronaut, a US naval aviator, aerospace engineer, test pilot, professor, spokesman and the first human to walk on the Moon. In 1966, as the command pilot of Gemini 8, he became the first American astronaut to perform a spaceflight. During this mission, together with astronaut David Scott, they conducted the first docking of two spacecraft in orbit. During his lifetime, he was awarded two medals by presidents Nixon and Carter and honorary doctorates by several universities. Neil Armstrong experienced his first aircraft flight at the early age of five, when his father, Stephen Armstrong, took him aboard the Ford Trimotor, also known as “The Tin Goose.” His innate passion for flying led him to earn his pilot’s license at the age of sixteen. At the age of seventeen he became a naval air cadet while studying aerospace engineering at Purdue University. His college tuition was paid via the educational Holloway Plan, which required three years of service in the United States Navy, where he served as an officer. Neil Armstrong was also accepted to MIT, but he never enrolled. In 1950, he became a fully qualified US naval aviator. He received his Bachelor of Science degree in 1955 and a Master of Science degree in aeronautical engineering in 1970 from the University of Southern California. Armstrong also served as a test pilot for the present-day Dryden Flight Research Center. In 1962, he joined the NASA Astronaut Corps. He later resigned from NASA in 1971, dedicating himself to teaching aerospace engineering from 1971 until 1979. Apollo 11 was the name of the spaceflight that landed Neil Armstrong, Michael Collins and Buzz Aldrin on the lunar surface. On Monday, July 21st, 1969, Neil Armstrong began his descent to the Moon’s surface by climbing down the ladder of the Lunar Module Eagle. Because this historic landing used slow-scan television, and also due to some weather and technical difficulties, the black and white images received were blurry. Nevertheless, they were broadcast to over 600 million people back on Earth. The recordings of the original Apollo 11 tapes were destroyed accidentally by NASA. Armstrong and Aldrin landed in the lunar plains known as the Sea of Tranquility. He set his left foot on the Moon and he uttered the famous line “That’s one small step for man, one giant leap for mankind.” Neil Armstrong planted the US flag and he spent two and a half hours on the Moon’s surface. 47.5 pounds of lunar material was collected by Armstrong and Aldrin. This historic landing marked the end of the Space Race between the US and the Soviet Union for supremacy in exploration of the outer space. It also fulfilled the goal set by late US president John F. Kennedy back in 1961. After setting the smaller Apollo Lunar Surface Experiments Package (ALSEP), Neil Armstrong went for the renowned Moon walk in the area known as the East Crater, 65 yards east of the Lunar Module. After 21 hours and 36 minutes on the lunar surface, Armstrong and Aldrin returned to the Command Module for the crew’s return to Earth. On July 24th, 1969, the three American astronauts landed in the Pacific and then spent 18 days in quarantine, due to possible contamination with lunar germs. 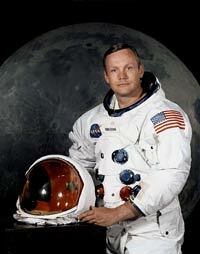 Neil Armstrong passed away at the age of 82, on August 25th, 2012 in Cincinnati, Ohio. His death was due to fatal complications from coronary artery bypass surgery, which he underwent on August 7th, 2012. The lunar explorer was survived by his two sons, Eric and Mark and by his second wife, Caro Held Knight, whom he married in 1994. He was cremated and his ashes were scattered in the Atlantic Ocean during a burial-at-sea ceremony. He remains the most popular, albeit notably humble, space hero in the history of mankind.